The Mercury 10 is a easy to use magnification system based on a Android tablet. It’s designed to read on a desk and is comfortable for longer reading sessions. 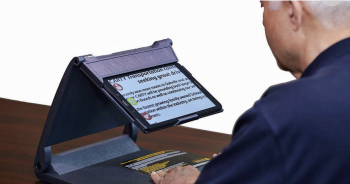 The unit can perform live magnification to enlarge printed material but can also speak it aloud accurately. A wide 10.1 inch display allows for a large viewing area. Mercury 10 also has a built in LED light with an Octa-Core processor ensuring easy reading in any lighting condition.